Attend a single class. Good for 3 months. Choose from several classes per day at two locations (San Marcos & Lockhart). No Mat Fee, No Towel Fee. Attend any 5 classes. Good for 3 months. Convenient Zen Planner member App to reserve class spot or renew class pass. 20% off ETY merchandise and events. No Mat Fee. No Towel Fee. Attend any 10 classes. Good for 3 months. Attend any class on any day throughout the month. Convenient Zen Planner member App to reserve class spot or renew memberships. In the heart of San Marcos, we embrace an alternative, loving community focused on healthy lifestyles, both mentally and physically. We understand the importance of keeping the body mobile and also the value of a peaceful mind. Our goal at Easy Tiger Yoga is to give our community a place where they will be pushed physically, challenged mentally, and grow spiritually, all within a down-to-earth, welcoming environment. "Please join us in our comfortable spaces in Downtown San Marcos and Downtown Lockhart. We try to keep the vibes easy so it’s just you and your practice." "I created Easy Tiger Yoga to tame the tiger in all of us." Nick Stiler created Easy Tiger Yoga to tame the tiger within us all. Our goal is to bring a space to the community of San Marcos, Tx where students can come and feel at home. We want you to have an easy practice, so you can go out in the world and live fiercely! When you walk into our studio we want you to feel a part of our community. © 2018 - Easy Tiger Yoga. All rights reserved. Jess was first drawn to yoga as a way to soothe anxious energy and replace unhealthy coping skills that were no longer serving their purpose. Over the years, her practice has radically transformed into one that invites in more stillness and presence, a lens through which to observe the mind, regulate the nervous system and understand what it means to be embodied. Jess believes yoga is for every body and is passionate about making it accessible to all. In her classes, she aims and encourages us all to keep it real, do our best, be good to ourselves and others. Jess’ love of travel has provided her with a worldly perspective, open mind and free spirit. She’s a mountain mama at heart who loves to sink her bare feet into the earth and discover new things with her Catahoula Leopard Hound. I love yoga because it makes everything make sense to me; it pulls together all of the things I learned, discovered, and enjoyed in my youth: The power of gymnastics, the beauty of dance, the emotional exploration and release of performance arts, the breath and rhythm work of music, the precision work of technology and programming, and the energy work and spirituality of religion. That’s what yoga means after all… to yoke, bring together, or unite. Not just your fingers to your toes, or your body to your mind, but uniting yourself with something bigger…finding the love inside of yourself and connecting it with the love all around you. While I was coming to know and change my mind, I still hadn’t learned quite how to take care of my body. In fact, at that point I still had incredibly disordered eating and sleeping patterns… therefore I was still suffering from intense emotional episodes. I came to understand the need for a routine, so my sporadic, mental yoga practice became a short but daily Hatha practice, and I prioritized caring for my basic bodily needs (sleep, food, water) . Over time, it worked. I could feel my body and mind coming together and becoming more stable day by day, week by week. While most western medical texts suggest that unless medicated, people with my condition will experience it more and more intensely as time goes on, to this day I have only seen in increase in my mental, emotional, and physical stability. Despite my regular home practice, it wasn’t until January 2016 that I participated in a public yoga class, and that was it. For the first time, surrendering to the instructor, breathing in unison with everyone around me, letting the difficulty fuel me instead of backing down from effort….. I got it. I really began to understand. I felt so exhausted and relaxed, yet powerful and invigorated. From that point on,Yoga wasn’t just an exercise anymore. It wasn’t just a meditation practice. Yoga was going to be my life. I completed my teacher training under Madilyn Chen with Black Swan Yoga that summer and from then on I have been teaching wherever I go. I’ve been privileged to teach Yoga for Stress and Anxiety Management at my High School Alma Mater, private lessons to boxers and martial artists, expecting couples restorative yoga, yin yoga with live music, and all sorts of fun variations, along with basic alignment focused practices. I like to make my classes as close to the needs of the students as possible, while of course sticking to the class style! I emphasize breath and mind focus, believing the extensive nerve stimulation coupled with slow melodic breathing and mental exercises to be what really sets yoga apart from other physical practices. I’ll briefly guide you to a safe mental state in which to practice and send you back out into the world with love. Having been a part of the San Marcos community since 2012 (eat ’em up), I’m happy to be able to serve y’all here in San Marcos by spreading light, love, and balance. Marilyn is a yoga teacher, musician, and artist from Austin, Texas and Portland, Oregon. Her yoga practice is informed by her engagement with many forms of creative expression including writing, painting, and music. While earning her Masters of Fine Arts in Visual Studies with a particular focus on large-scale abstract painting, she began to explore the relationship between physical movement and energetic flow as an important element to her work. After living through the struggles of a post-graduate life, she eventually arrived in her first yoga studio class on a whim and a whole new world opened up that connected many disparate elements in her life. With an insatiable curiosity, she began her training in hatha and hatha flow earning a 200 hr certification from Yoga Yoga in Austin, Texas. She is continuing to study yoga with a particular interest in modification techniques, anatomy, philosophy, mythology, and ayurveda. Her teachers thus far for whom she is most grateful include: Ana Pilar Cruz, Angelena Stokes-Wickersham, Sarah Sullivan, Stacey Loop, Kristen Folkens, Mark Uridel, Chase Bossart, Dr. Douglas Brooks, and Judith Lasater. As a yoga teacher, her classes are welcoming, calming and grounding meeting each student where they are. With a light-hearted approach and an invitation to bring loving self-awareness through breath, mindful movement, and an alignment-based focus, students can cultivate strength, flexibility, stability and ease within their own body. 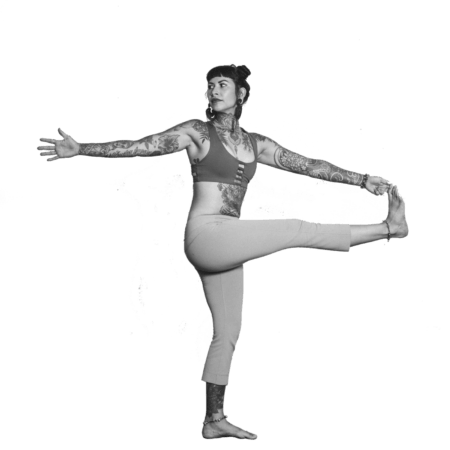 Marilyn is currently substitute teaching vinyasa, restorative, and hatha flow classes at Easy Tiger Yoga in Lockhart, Texas and offers private sessions for beginners at her home studio also in Lockhart. Heather, AKA Heater, has been an avid yoga practitioner for many years, first being introduced as a young child. She finds the greatest joy in teaching one-on-one personalized classes, where she can really invest in a student’s personal needs. She has been a San Martian for almost 10 years now, and is full of gratitude for the chance to help people in the community find inner peace and connect with their bodies. When not on the mat, Heater is a lifelong theatre kid. With experience acting, directing, building and designing. You’ll be sure to feel the energy and playfulness when meeting her. She is currently teaching Classical Hatha, a meditative style practice built on the structure of holding poses for a few minutes to go deeper into the asana, then relaxing to allow the flow of built up prana to move throughout the body. The goal? Inner peace off of the mat as well. She is also an avid teacher of meditation (Focusing the mind) and pranayama (Control of the breath) techniques. Keep your eyes peeled for new styles coming soon! Originally from Dallas, Texas; Maddy Fondren has been living in Austin since 2011, and has been a part of the Easy Tiger Tribe since the beginning. Maddy was first introduced to yoga in 2012 while discovering herself on her adventures and travels. Since she started practicing yoga, she has begun to understand herself and life in a whole new perspective. After moving back to Texas from Portland, OR in 2017 she found the teacher training program at Namah Shivaya Jyoti Yoga and completed the 200-hour Hatha course. In December 2017 she completed a Yin Yoga training with Gioconda Parker. She is currently working on her 500 hour certification at Practice Yoga Austin with an emphasis on Advanced Asana and Philosophy. All of her Advanced Yoga teacher training has been directly from the wise and knowledgeable minds of her wonderful teachers- Gioconda Parker, Iva Drtina Hall, Jenn Wooten, Shanti Kelley, Shawn Kent, and Kiely Walters. 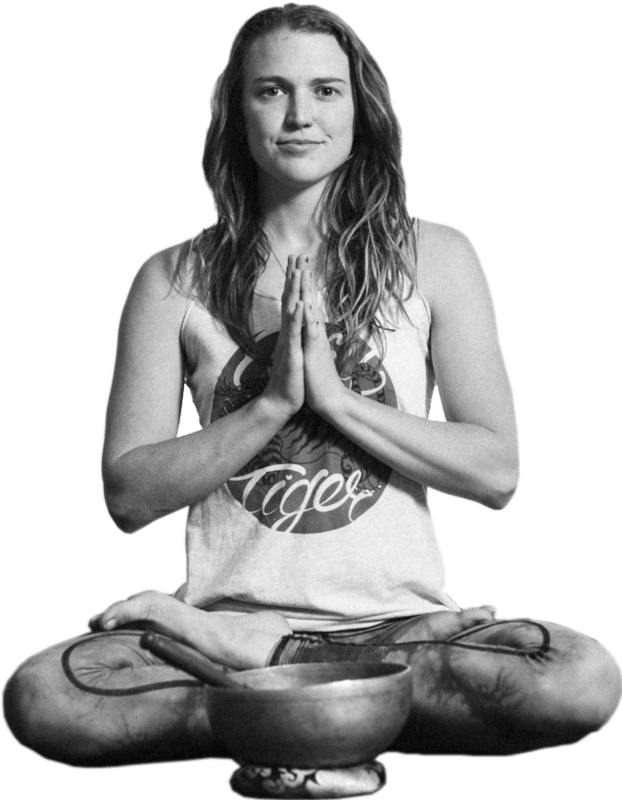 Maddy Fondren specializes in Yin Yoga and Meditation. She also loves to teach Vinyasa and Hatha Yoga. As Maddy believes balance in life is health, Maddy’s classes focus on awareness, the self, being present, and cultivating a sense of wholeness. Students can anticipate a practice that is filled with mindful movement and will always change depending on the energy of the day. In addition, she brings a deepened savasana by the soothing and healing sounds of Tibetan singing bowls and meditation chimes. Her goal as a yoga teacher is to help others to know they have the ability to heal themselves. She will be teaching a Yin class on Tuesday nights and Friday afternoons at Easy Tiger San Marcos. Maddy is very passionate about teaching yoga and welcomes everyone to open their heart to the divine within and all around. Yoga found Kris a bit later in life, 10 years ago. But ever since her teen years, she had been attracted to yogic philosophy and the idea that the way we live in our bodies, is reflected in how we live our lives. In 2015, Kris was was certified 200 RYS with Jason Lobo and has continued to deepen her understanding and experience of asana. She has practiced different forms of yoga but her love of alignment feeds her passion for a classic Hatha style yoga. When she first started practicing, Kris found even savasana painful. Now she can’t imagine a life without yoga. She believes yoga is a beautiful practice that tunes up and unifies the body, mind and spirit. In her words “whether we are young or old, weak or strong, solid or wobbly, ectomorph, mesomorph or endomorph—we can all practice together and get stronger and lighter, more flexible, more in touch with who we are, and more fully alive.” Kris teaches Hatha and Gentle Hatha, as well as workshops and classes that focus on healthy aging. Kris loves sharing the gift of yoga to inspire and empower humans 50+ to create the lives they want. She believes that our most important creative activity is creating our own lives. New to yoga? Been practicing awhile? Want to learn more about alignment-based movement? Come practice with Kris and explore the possibilities. Izzy began practicing yoga in 2013 to help with minor scoliosis, but has been familiar with the practice as she sat in meditation occasionally and practiced postures with her mom and bunny as a kid. She took a 200hr Hatha YTT intensive at the White Lotus Foundation in 2014, and has been teaching since. Although she began with the goal to straighten her spine, after about a year of practice her goal became to love her spine, and later, to let her spine get hugged a little more often. She believes in the power of people and the power of community, as well as the power of transformation in ourselves, and that all of those thing start in the same place – with the knowledge of who and where we are, and the willingness to express that. Izzy is certified in YoStrong and Hatha Yoga, and loves practicing Kundalini. In the summer, you can find her easily because she does not stray far from the San Marcos River… the Blanco if it’s a special occasion. She has a close relationship with the sun despite it being long-distance, and enjoys diving headfirst into philosophy books. She studies Psychology and Philosophy at Texas State and values good conversation and good coffee. Elise lives in San Marcos, TX and enjoys being part of that wonderful local community. She has been teaching yoga for 6 years and been a student of yoga for much longer. Her style of teaching is a mix of Hatha and Vinyasa Yoga, cultivating mindfulness with ease of movement through the poses. In her classes she brings great detail and awareness to your body, as well as attention to breath, to allow your mind to be present, embracing and experiencing each moment. She comes from a place of love, making sure her students feel cared for and safe. Her personal practice is based in every day happenings, interactions and moments, where she practices being kind, patient, and peaceful. She hopes that her teachings on the mat can help serve and guide you on your own personal journey into yoga and life. In addition, other than yoga, Elise enjoys coaching and playing volleyball, being in nature, swimming in the river, and cuddling those she loves. Jessica has been teaching yoga in San Marcos and Austin since 2010. She is a 200 hour Registered Hatha Yoga Instructor, and has over 400 hours of yogic training from Yoga Yoga in Austin. Her roots lie in Viniyoga, which is a style that is designed to bring out the best in each practitioner. She is also certified to teach Vinyasa yoga and children’s yoga. All of her classes are breath centered, and adapted to the students in the class, allowing the students to build strength and flexibility in a safe and nurturing environment. Jessica is also a mom, a wife, and an actor and writer for theatre and films. Her personal yoga practice, as well as teaching, has deepened and enhanced her life as an artist tremendously. She loves improv, playing video games with her son, walking at Prospect Park, swimming in the river, and being a part of the amazing community of San Marcos. Ashley grew up in the Texas Hill Country and after finding her first yoga class at the age of 16, again and again she has found something new in the practice. Her first teacher training was for her own practice but after discovering the gifts of the practice she started teaching shortly after the training was over. She continues to study healing modalities of all sorts including energy work, sound healing, meditation, movement and many more. You can expect a class that is light- hearted, nourishing, trauma sensitive, and focused on embodiment through asana, pranayama and mantra. In her ability to connect emotionally and somatically she hopes to guide students to their inner teacher, healer, and light. When not on the yoga mat you will find her in outside playing, writing and making art. Ashley is certified in Children’s yoga, 200 hour Hatha, 200 Kundalini. She teaches kundalini, hatha based flow classes, children’s and family yoga and holds space for women’s circles and healing sound baths. E- RYT is a creative, traveling yoga instructor based out of San Marcos, Texas. The world is her studio, and her goal is to share with each individual a divine mixture of natural + holistic healing, psychology, and the magic of yoga to every body- regardless of age, recovery, background, or disability. Recovery, Prenatal and Special Needs certified. She is here to lend a helping, healing hand. Jenna clark is an anatomy loving, enthusiastic, dog adoring, globe trotting yoga teacher who is a sucker for a dance party, dark beer, and a doggie cuddle sesh. Jenna has been on her yoga journey for two years and has been teaching for 5 months. She has a background in collegiate sports and a Bachelor of Exercise Sports Science. Jenna received her 200 hr YTT certificate with Jason Lobo at Namarupa Yoga. Her training had a major focus on alignment and postural yoga. Jenna believes in healing via a sparkle of sweat, some functional movements, and the power of communication. Her knowledge of the human body allows her to connect with any student and give support to any body type. Jenna LOVES extreme sports, so her practice is geared toward movements that create a safe, strong, and mobile human body that is a reliable vessel throughout life for all the activities! You can always find her popping up into a handstand or climbing on something. Jenna believes yoga is a journey that can help us all sparkle on and off our mats. Come prepared to sweat, work hard, and be lovingly pushed and expanded just beyond what you may think possible.